This bold and striking design comes courtesy of Mukoyama Architects, and harnesses the beauty of angular geometry and open spaces to create a confident, contemporary abode situated just outside of Tokyo. From the outset this home draws the gaze of passers-by, with the dark wooden slats of its facade proudly constructing a geometric formation, as hints of white, glass and paler wood peep out to provide a contrast of colour and materials. The interior of the home is no less special, with its open spaces incorporating large stretches of glass, creating rooms that invite light and air to flow within and conjuring a serene and uplifting atmosphere. 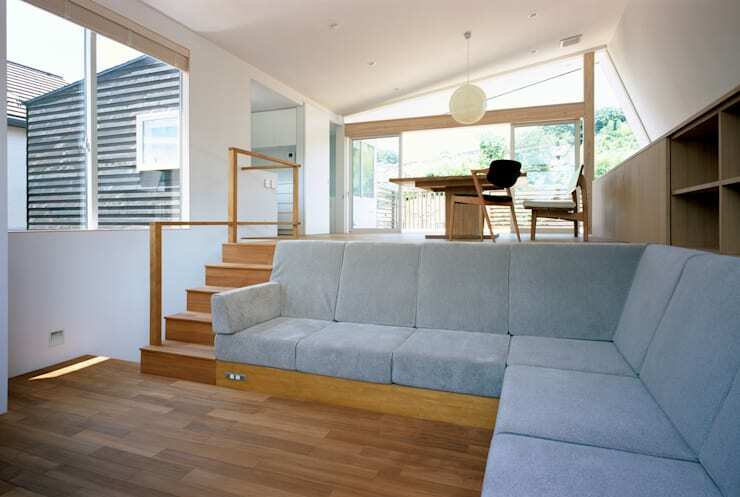 Contemporary furnishings and a muted colour scheme complete the aesthetic, with the use of pale timber prevailing throughout the interior alongside soft textiles, which create a lengthy sofa in the home's loft and traditional Japanese flooring in a downstairs space that could happily house a second living room or bedroom. All in all this home showcases a beautiful, modern design, and oozes inspiration for admirers of geometric architecture. Take a tour of the images below and see what you think! The facade of the home presents a striking, geometric construction, with its dark timber slats flowing in horizontal formation, and patches of paler wood, white rendering and glass providing an aesthetic contrast. Sunlight flows through the open areas, from the lofty living and dining spaces of the upper level, to the classic bedroom below, creating an airy atmosphere within this bold, contemporary exterior. A close-up of the home's upper level showcases a stylish, angular construction framing a simple, understated area for dining and living. Large expanses of glass windows and doors border each end of the space, allowing light and air to permeate and flow throughout, and adding to the relaxed atmosphere within. The smooth surface of a beautifully constructed deck can be seen in the foreground, providing an elegant and elevated area for outdoor living. The lofty living area delights in its contemporary style, with the pale tones of its timber finishes and furnishings, in tandem with its angular, white walls, creating a refined and soothing atmosphere. A large, minimalistic dining table sits central within the space, framed by a contemporary stool and armchair, while a stretch of grey couches lie in wait on the loft's lower lever, inviting relaxation and casual interaction. A close-up of the loft's living area reveals an array of contemporary, grey couches lining the space. These provide a colour contrast against the room's timber and white decor and present a comfortable locale upon which to relax and unwind. Light streams through the windows bordering this level of the home, illuminating the living area from three vantages, while an array of storage has been constructed behind the couches, waiting to host decorative elements reflecting the occupants' personal style and character. 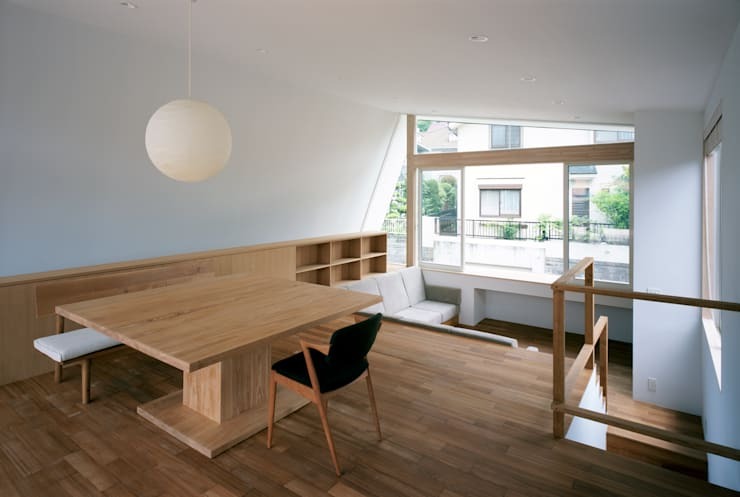 This room within the home sits on the lower floor, but still employs the open design that makes this abode so special. 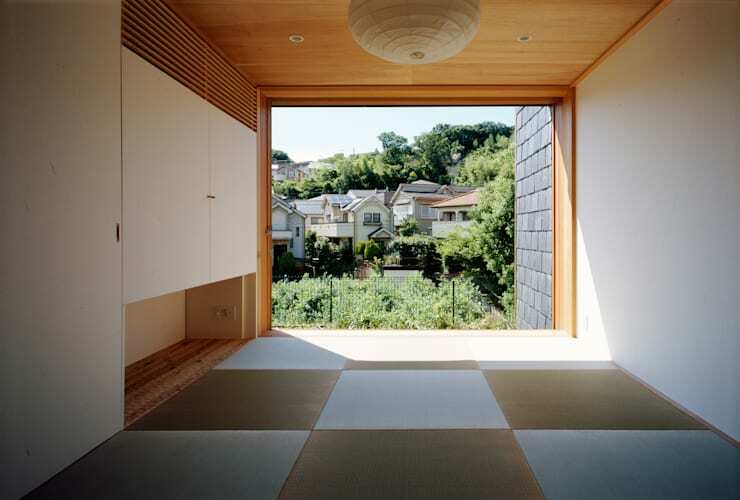 An expansive portal sealed by traditional, Japanese paper screens invites light and air to circulate throughout, highlighting the room's classic elegance and pale colour scheme. A range of storage has been included in a series of white cupboards and cabinets, creating a versatile space that could be used as a bedroom or secondary living area. 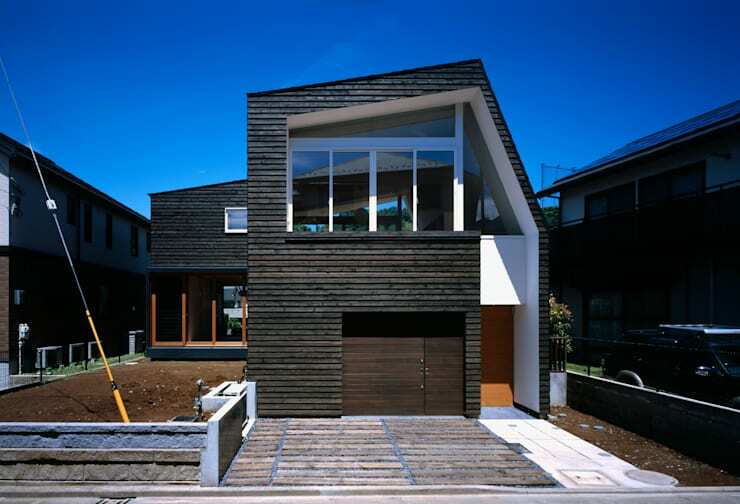 For more geometric design inspiration have a look at 4 Families, 4 Homes, 1 Block of Land. 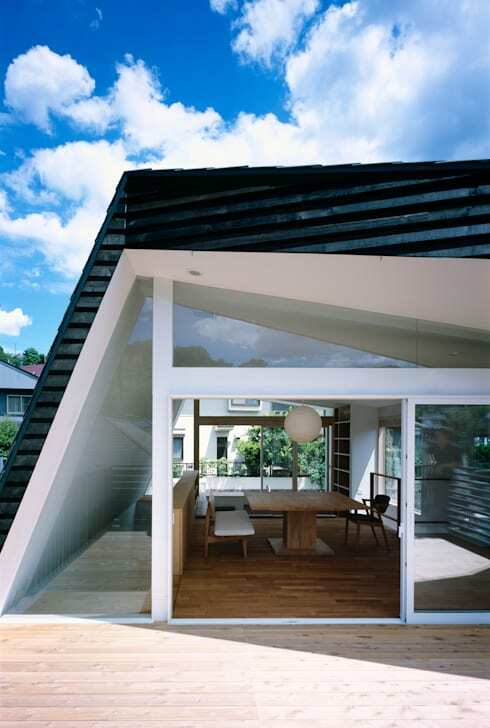 Do you like the bold lines and angles of this geometric home? Tell us your thoughts below!